architectural ornament material for buildings like business center, subway station, airport, train station and so on. Aluminum single curved panel with PVDF or powder coated can keep more than 15 years, and it can be processed into many different shapes by your design. 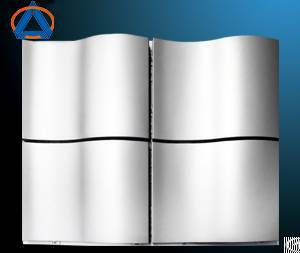 People usually use Aluminum single curved panel for curtain wall panels or pillars, you can design the shape, and we can finish it to meet your requirements. Many of business buildings, airport, subway, station and train station use it. It�s beautiful and durable. Size: Follow your design (less than 1800 x 6000mm)�.